In a longitudinal study of bakers’ apprentices, reluctant or ambivalent entrants to the work of baking, discovered an affinity for their work through processes of belonging to a workplace, becoming and being bakers. Through extensive, thorough and at times demanding engagement with bakers’ work and the forging of strong personal relationships with other workers, apprentices developed a ‘passion for the trade’. Therefore, for some of these apprentices, work had become not just a means to earn a living, but a form of vocation. Given that individuals’ live spans consists of a long component of time at work, it is important to understand the role of apprenticeship in forming robust occupational identity. It is especially significant where apprenticeships lead to transformation of workers’ perspectives of work being more than a job, and the development of work as a form of vocation or calling. This article explores the mechanisms supporting the ways in which affiliation to work, engagement in skilled practice and the formation of an attachment to occupational identity, occur. The article illuminates aspects of apprenticeship supporting the transformation of individuals’ perspectives on work from just a job to a calling. In so doing, artisanal work is provided with the recognition it deserves, as a viable and sustainable career choice into the uncertainties and challenges of future work. Hirschi, A., Keller, A. C., & Spurk, D. M. (2017). Living one’s calling: Job resources as a link between having and living a calling. 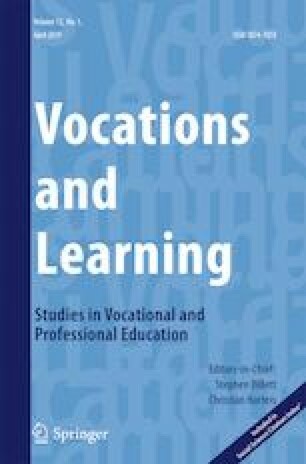 Journal of Vocational Behavior, 106, 1–10 https://www.sciencedirect.com/science/article/pii/S0001879117301501. Accessed 31 Jan 2018. James, S. (2015). Finding your passion: Work and the authentic self. M/C Journal, 18(1) http://journal.media-culture.org.au/index.php/mcjournal/article/view/954. Accessed 31 Jan 2018.